Linterna Mágica development is on hold. Read about future releases for more information. Linterna Mágica is not working with specific browser or plugin or operating system. Is it possible to supported it? The short answer: I had spare time and was curious is it going to work. Playback of video clips in a browser is technically possible since the existence of the <object> tag (around 1999; maybe even before that?!). 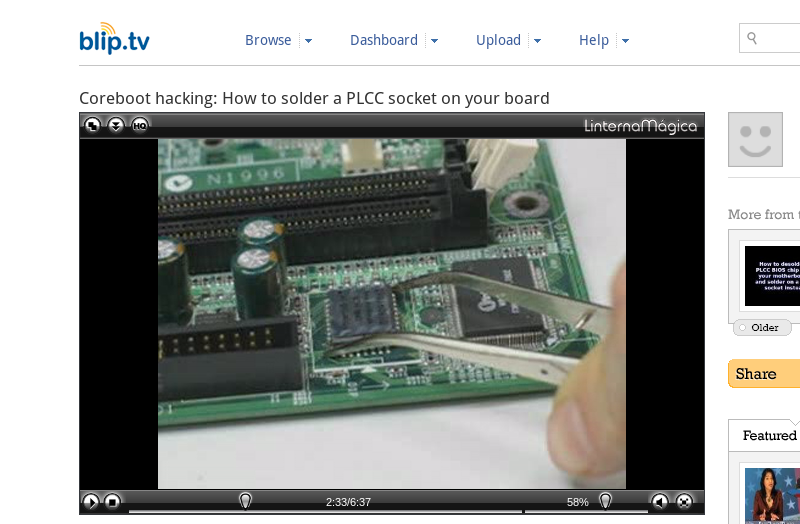 To watch a video inside a browser the user always needs a plugin (HTML5 changes that a bit). Why it should be flash plugin? Most of the time I do not have Gnash or Swfdec installed. 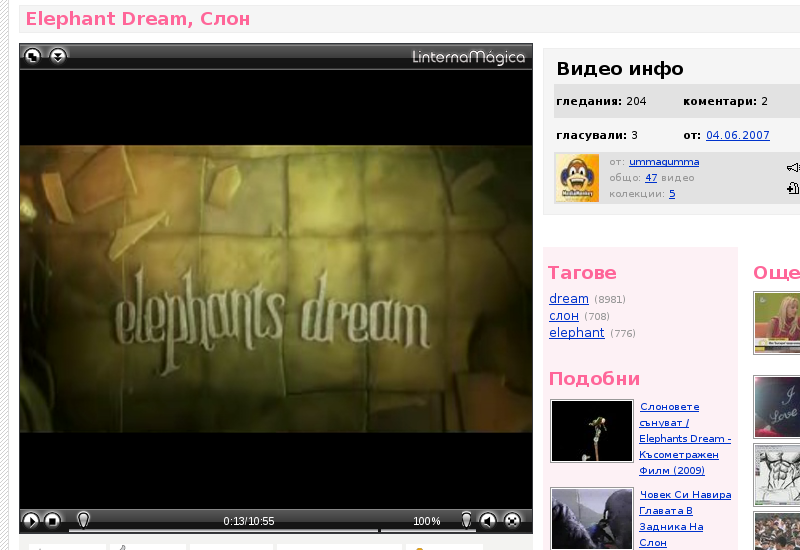 I do not care about flash, except sometimes for video clips. I got tired of using Bash/Perl/Python... scripts to download video clips and watch them. Linterna Mágica was born. The last stable release of Linterna Mágica is from 2014. There are major changes in browsers in recent years that currently prevent video playback. The video URL extraction logic potentially works on most websites, but the only way to watch the video is to download it and play it outside of the browser. With the situation at hand, unfortunately most users should not be encouraged to rely on Linterna Mágica. More information is available in the text below. The current approach, running the code in the same code context as the web page is a dead end - the work arounds for bug fixing became ugly and hard to implement at all sometimes. The code is becoming hard to maintain for the long term and it is becoming bad software design. The user script (user code injection) approach reached the limit of its technical possibilities as I see it, for the software Linterna Mágica became and the desired direction for evolution in a software freedom respecting manner. The code must be migrated or possibly programmed from the ground up as a browser extension, which has a lot of differences technically (the main "flow/loop" of the logic) than userscripts. Additionally in the last few years browsers are going under a lot of changes and some of the components required by Linterna Mágica were dropped out of them. For example NPAPI which allowed browsers to load external plugins, such as video players, was removed. There is video support in HTML5, but this by itself requires (major) redesign. Mozilla Firefox (and fully free software browsers based on it) had about three major extension API redesigns in a short period of time. This also led to changes in Greasemonkey (the extension loading Linterna Mágica into the browser). Linterna Mágica needs a major redesign, but there are trade offs that depend on the approach taken. And the choices are not many. For quite some time an idea is forming how to overcome the technical obstacles and open some room for new features. With the migration of most browsers to WebExtensions as an API for extension development there seems to be a common way to find a solution. I have ideas what might fix the issues, but they require time to study the documentation, implement, experiment and test. Currently I am on the phase of reading documentation about possible implementations. My schedule is very dynamic and I cannot always spare time. It will quite take me some time. If you can help in any way, do not hesitate to contact me. Since there were questions about the campaign, the point and why this way, we decided to add the answers and the explanation here as well. We are running crowd funding campaign for Linterna Mágica T-Shirts, that would help development and spread the word about us. Our goal is at least 20 preorders for the prints to be produced and delivered. The campaign ends at 20th of March. If the campaign is successful everyone who ordered a T-shirt will get one. The money will be split between me (the developer), Anton (the designer) and the campaign site. If the required minimal amount of preorders (20) is not reached, the campaign fails, the people gets their money back and that's it. Why this indirect way for donations? The direct ways were always on the website, but donations for Linterna Mágica are rare. We had one big donation from ThinkPenguin (Chris, thanks again!) few years ago. Only few people donated (you know who you are, thanks!) over the years. Last year we had a survey in which very few decided to participate. It showed that we have a problem in the donation area. This is a zero-cost-entry campaign for us... well I've spent one night with 4 hours of sleep, but still. :) The campaign on the T-shirts themselves could reach people (offline) whom we cannot, because we don't walk on the same path over the Internet. And since donations are rare, we are trying this more dynamic approach with additional benefit for those who are wondering should they make a financial contribution. Thanks to a Reddit (and probably Linterna Mágica as well) user, we met our goal at the second or the third day of the campaign. Although only the base goal was reached the campaign is successful. We decided to use the money from the T-shirts campaign and the donations relevant to it, to fund a new interesting and exiting project related to free software. Stay tuned! Epiphany versions older than 2.30 might have problems with Greasemonkey. Free software versions of Firefox that support the Greasemonkey extension should work. Only GNU IceCat, Web Browser/ABrowser and Iceweasel are tested. Plugins that can handle "video/flv" and "video/mp4" should work right away. Some plugins provide an API which is used in Linterna Mágica to support web controls, but this will require modifications to the code, if the plugin is not listed as supported. There is a configuration option to switch between controls provided by the plugin and Linterna Mágica. Versions older and equal to 2.30 does not have full API support for web controls. Newer versions of Totem have been patched (#623790, #618929) and should work. Note: Have in mind that gecko-mediaplayer depends on mplayer for playback. Mplayer is free software by itself, but it can load and recommends binary only codecs. The completely free (as in freedom) distribution of GNU/Linux, Trisquel provides clean version of mplayer. Probably these plugins are available in your GNU/Linux distribution as a package. You can test your browser plugins and the installation of Linterna Mágica at the test page. Linterna Mágica is programmed in such a way that it might work (and it does) with web sites not specifically tested and supported. 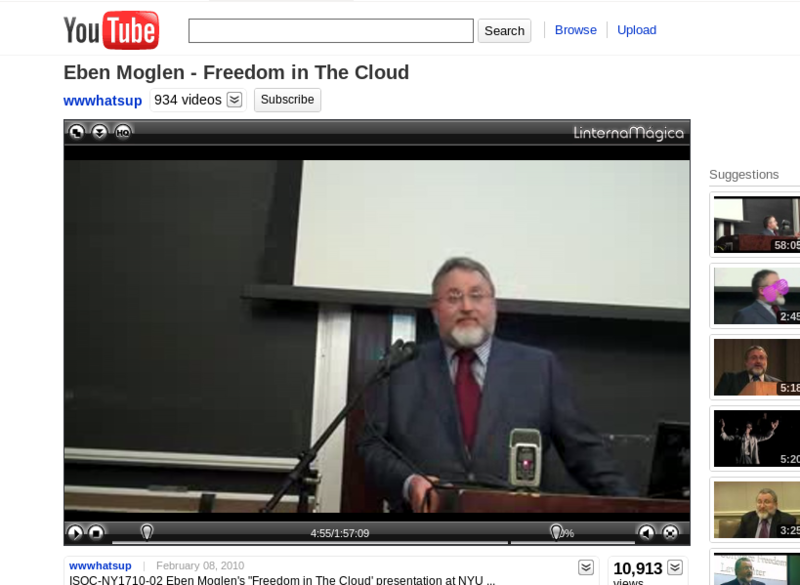 This is achieved by regular expressions, patterns and similarities between video sharing and posting sites. The main idea is that very little should be needed to support a new site - few changes in a regular expression, adding an address from where the clip should be extracted and so on. By default Linterna Mágica runs on every site, but that might not be suitable for you. Read the documentation to find out how to stop this. Websites that use RTMP to transfer the video are not supported. For the moment flash objects embedded in remote web sites do not work. Since version 0.0.9 some remote objects are detected and a link to the web page of the video is provided. Linterna Mágica is not working with specific browser or plugin or operating system. Is it possible to support it? 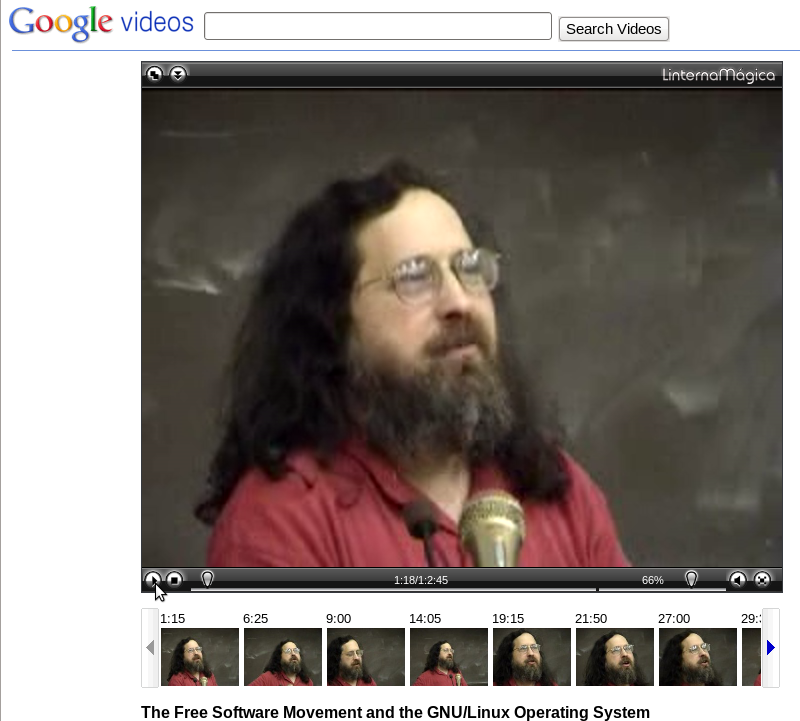 Only free software will be supported. Explicit support for non-free software will not be provided. If Linterna Mágica is working with non-free software you must be very "lucky". Yes, that is sarcasm! Linterna Mágica is free software. You can distribute it and or modify it under the terms of the GNU GPL version 3 or later. You can see the license in the COPYING file in Linterna Mágica source tarball or at the GNU project web page: http://www.gnu.org/licenses/gpl.html. All the supported browsers and plugins are distributed under a free software license. Another YouTube bug-fix release. Because we love YouTube so much. ;) Fixed false positive encrypted signatures detection. In attempt to fix issues with Firefox, from now on Linterna Mágica have to be started manualy by a click of a button. Exceptions are YouTube, Dailymotion and Vimeo. More can be added. Read the docs. (#39111, #41577, #39320). YouTube is using AJAX (background requests) for the entire navigation around the site. 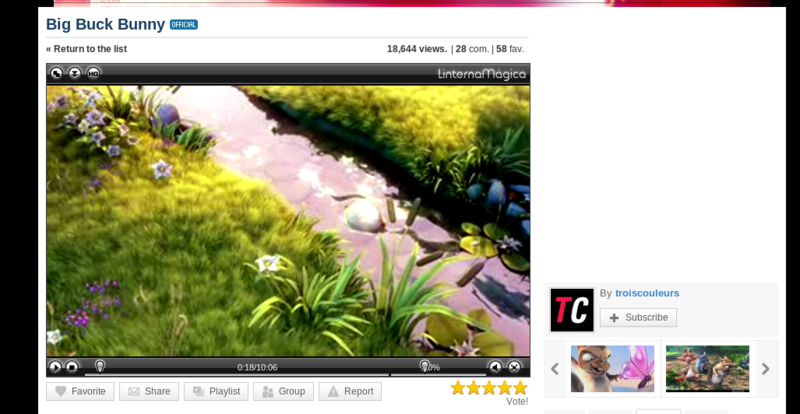 Linterna Mágica forces foreground requests all around YouTube, so it can work. Faster loading in YouTube - from few milliseconds to few seconds. Automatic playback of next song when clip is unavailable in YouTube playlists. Added experimental feature to rewrites YouTube video urls to https when a page is requested over https. Should work around mixed content warnings in Firefox. See also bug 39726 (Bug #39726). A simple one time switch from website HTML5 players to Linterna Mágica is brought back. By default everything is replaced. This option is available via custom configuration. Fixes bug 40542 (Bug #40542). Added support for playback in video.repubblica.it without flash plugin. Fixes bug 40627 (Bug #40627). Added format configuration option. It can select preferred formats (webm/h264/mpg etc.) See the docs. Improved quality selection. It is now possible to quality to 360p, 480p etc. etc. Added support for YouTube playlists - LM can now play the whole list (shuffle and ordered). Switching between HTMl5, Flash and Linterna Magica is derecated. The default behaviour is to replace the default player of the website. Scriptish, Tampermonkey, Chromium and Iceape are considered officially supported. These versions are automatically build from the Git repository and contain the latest fixes and features. Only userscripts are provided. The daily builds are not stable!!! Even the builds from the stable branch might be considered unstable. If possible use a stable version from the the list of stable releases. When enough issues are fixed in the stable branch a new bug-fix release is available (for example 0.0.9-4). This branch is stable enough to be used, but If possible, use a stable version. The version in the master branch is the one under active development. If you decide to use unstable version, it is recommended to disable any other version of Linterna Mágica that is installed. If you can't disable userscripts with your current version of the Greasemonkey extension (or the browser implementation for userscripts), then uninstall any other version. These builds do not check for updates, even if configured to do so. You can download the source code of any version from the Git repository at our project page at Savannah. The Git master version never checks for updates. Each version under branches has the latest fixes for the branch. The version of Linterna Mágica is set to the version of the latest released (or to be released) bug-fix version. This is the latest, not the first released version from the branch. The versions under tags are the stable releases. Keep your configuration in separate userscript file. This way your preferences will stay intact when new version is installed. This works with builds from the master Git branch and versions above 0.0.10. Read the documentation to find out how to use this script. The following link is not an actual version. It is meant to test crawlers and robots handling by Awstats on Savannah. This is used only for the purpose of download statistics. Please do not click this link. Normally this text and the links should not be visible in your browser, unless you had disabled CSS. The following links are for the documentation of the latest stable version. Documentation for older releases is provided with the source code archive of every version in our Savannah download area. You can report bugs at the project's page at Savannah. Use the Bugs tracker, the "Tech Support Manager"/"Support" is now deprecated. The mailing lists are available in the Mailing lists section at our Savannah project page. We have two official chat rooms. A bot (lm-jabber2irc) relays messages between the rooms, so you can join either. The main developer's nick is Dreamer in Jabber and thedreamer in IRC. Linterna Mágica is free software and can be downloaded, shared and modified freely. 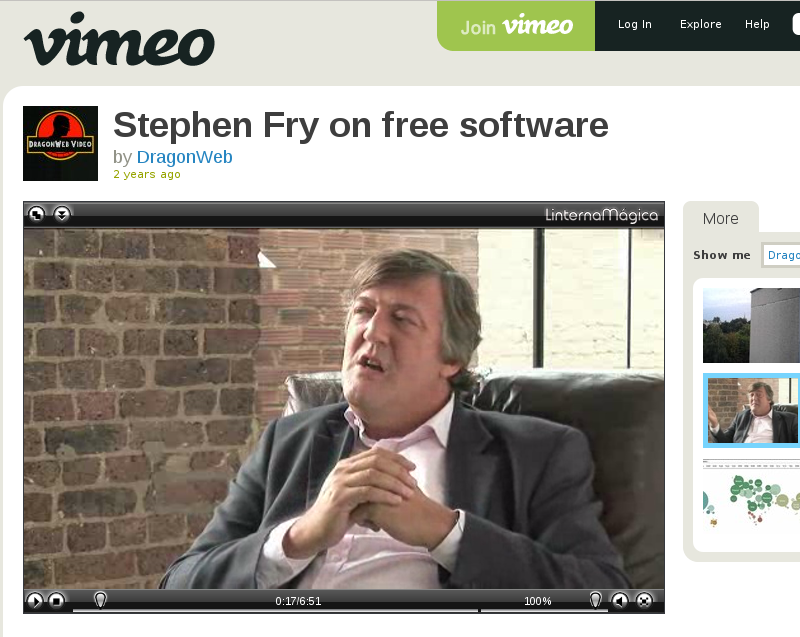 It respects your software freedom by allowing you to watch videos on the web entirely with free software. If you like it and find it useful, then consider making a donation. Enough donations will ensure faster bug fixes and new features, as I would be able to take some time off work and spend my energy on Linterna Mágica. You can donate via PayPal. If you already made a donation, thank you! A special thanks goes to ThinkPenguin for making the first substantial donation to the project in the amount of €100. It has been quite quiet here for a long time. Unfortunately our plan for a side project related to free software supported by the money from the T-shirts campaign didn't go live. This project is on a great hold. It has taken a lot of my spare time over the years and did not met some of the goals that I had for it. At the moment my spare time is dedicated to a real life escape room project in Varna Bulgaria. Our campaign is over. It was a success! We decided to use the money from the T-shirts and the donations relevant to the campaign, to fund a new interesting and exiting project related to free software. New bug-fix release 1.22 is available for download. New bug-fix release 1.21 is available for download. We have a running campaign for T-shirts. Twenty (20) preorders are needed until 20th of March for the campaign to succeed and the T-shirts to be printed and delivered. Buying a T-shirt helps development and spread the word about Linterna Mágica! New stable release 1.20 is available for download. Litecoin and Bitcoin are accepted for donations. New stable release 1.10 is available for download. Updated version of the helper script (Utilities section) for configuration. There are issues in Firefox with the older version. Use the new version otherwise it might not work. New stable release 1.0 is available for download. The versioning scheme is changed - major_version.minor_version. Stable releases have minor versions divisable by 10 (10, 20, 30) and 0. Bug fix releases have minor versions non-divisable by 10 (1..9, 11..19, 21..29 etc). The major version will increase with significant changes. Since Identi.ca migration to pump.io we do not have microblogging group. There is no permanent solution yet, but the microblog link points to my personal account. Meanwhile checkout our IRC and Jabber rooms. A bot (lm-jabber2irc) relays messages between the rooms, so you can join either. The source code repository of the project migrated from SVN to Git. The website source code repository migrated from CVS to Git. The website domain changed from linterna-magica.nongnu.org to linternamagica.org. The source code repository of the project will be migrated from SVN to Git soon. The website source code repository will be migrated from CVS to Git soon. The website domain will change from linterna-magica.nongnu.org to linternamagica.org soon. Bug-fix release 0.0.13-2 is available for download. The survey is now over. The final results are available. Bug-fix release 0.0.13-1 is available for download.